Guided by its Quaker heritage, Swarthmore College has since its inception declared a commitment to provide academic excellence in the context of social responsibility, by helping its students realize their fullest intellectual and personal potential combined with a deep sense of ethical and social concern. Swarthmore College students, faculty, and staff have long engaged issues of social responsibility, combined with a rigorous approach to intellectual inquiry. Students are encouraged to study and actively work toward positive social change in the areas of social and political issues to which they are committed. The Lang Center supports faculty, students, and staff with advice and guidance, space for meetings and events, transportation resources, as well as funding for projects, internships, and curricular design. The Lang Center encourages faculty, staff, and students to be involved with surrounding communities locally and globally, for mutual benefit and reciprocally enriching relationships. Signature programs of the center include a rotating visiting professorship that brings to campus activists or academics committed to social justice, civil liberties, human rights, and democracy for a year of teaching and community interaction. A scholarship program and a specially designated fund support students who want to create long-term sustainable social-action projects, and a summer internship program sends students out to learn by doing and observing. Staff and faculty as well as students are invited to volunteer and serve, and faculty are supported as they create and redesign courses to incorporate significant elements of community-based learning. The College collaborates with community partners in these endeavors. A collaboration of particular note is the Chester Higher Education Council, in which Swarthmore works with the five other colleges and universities in Delaware County to support educational needs, resulting in the creation of the collectively supported College Access Center of Delaware County. The heart of the approach to social responsibility at Swarthmore is the high energy and deep commitment that its students, faculty, and staff bring to it. The goal of the College and the Lang Center is to provide a learning environment that supports our College community members and the communities of which we are a part. 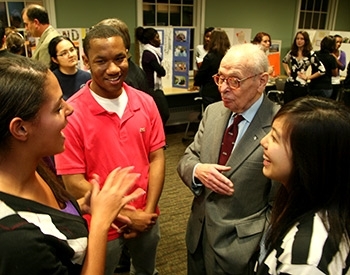 Eugene M. “Gene” Lang ’38 (1919-2017), chair emeritus of the College’s Board of Managers, was a giant in the world of education, a champion of the liberal arts, and an acknowledged force in promoting civic and social responsibility among students, faculties, and educational institutions. He not only helped realize the dreams of thousands of students at Swarthmore and around the country, he also inspired countless others to act similarly, most notably through the example he set by establishing the “I Have A Dream” Foundation, for which he was a recipient of the Presidential Medal of Freedom. In 2001, Lang created the endowment to establish the Lang Center for Civic and Social Responsibility. In addition to the Lang Center, his gifts to Swarthmore include the Lang Music Building, the Eugene and Theresa Lang Performing Arts Center, endowed professorships, support for faculty research and student financial aid, the Lang Summer Social Action Awards, and the Lang Opportunity Scholars Program, which provides funds for students to design and carry out innovative service projects. He was also the founder of Project Pericles, a national organization of colleges and universities working to encourage and facilitate inclusion of education for social responsibility and participatory citizenship as an essential part of their educational programs.